A few weeks ago Anthropologie granted my #DearAnthro wish! (For those of you wondering what that is, Anthropologie hosted a week long giveaway on Instagram and they were randomly granting peoples wishes. All you had to do was pick your favorite item from Anthro and take a picture of it and tag Anthropologie in it and cross your fingers that they pick you as a winner!) It just so happened that my blogger bestie Daniela and I were both chosen as winners! I was SO excited, I seriously never win things like this! I chose the cable knit pom pom beanie from Anthro and Daniela picked these darling embellished gloves. Since we both chose winter gear as our prize, we decided to do a collaboration together to show off how we would style these cozy pieces! You won't want to miss Daniela's post, her style is almost identical to mine! You can take a look at her post here! If you follow me on Instagram you probably have noticed that I have already worn my cable knit beanie like 50 times already.. oops. When I get a new item that I love, I tend to wear it over and over until I get something new to obsess about. HAHA. I wanted to style my beanie in a holiday-esque outfit because Christmas is right around the corner, so something sparkly was a must. I layered my favorite polka dot sequin top from J Crew over a plain white button down. 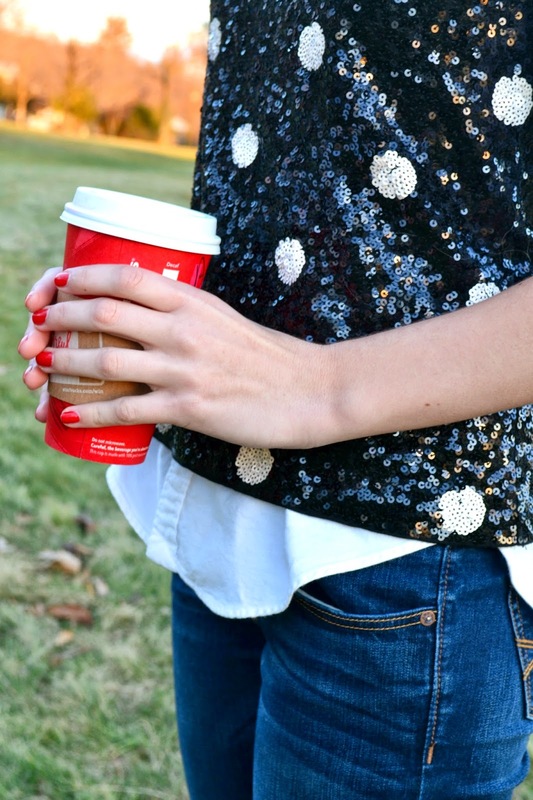 Pearls and my beanie(and Starbucks) added the perfect touch to this fun outfit! Don't forget to head on over to Daniela's blog to see how she styled her adorable gloves! Gorgeous instagram and blog, this outfit is so pretty!